Vesak Celebrations at our Temple will be held on 25th & 26th May | Sri Lanka Buddhist Vihara Perth Western Australia | The Temple serves the needs of the Sri Lankan Buddhist community living in Perth and the surrounding area. Please note that this year Vesak celebration will be held on 25th and 26th of May at our temple. Vesak Week will be starting Saturday, 18th May and there will be daily Dhamma Deshana at 7pm. Ata Sil & Meditation for Vesak Poya day on Saturday, 25th May at 7:30am to 4:30pm. 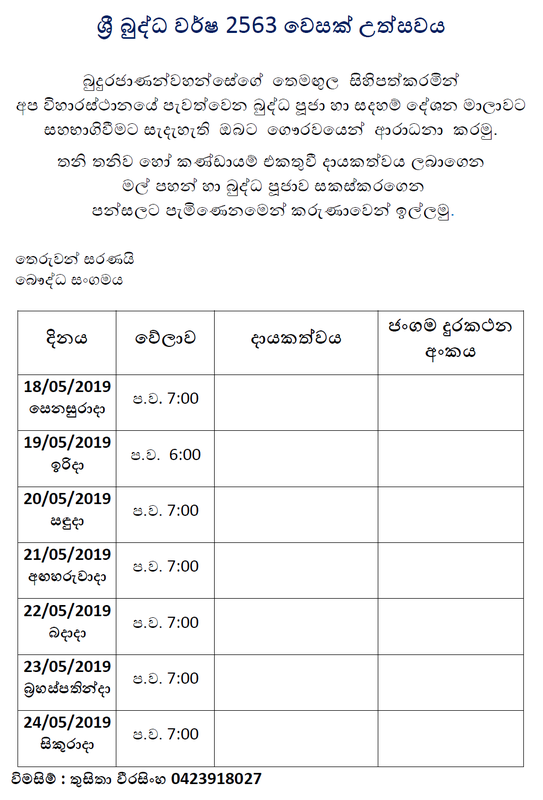 If you like to sponsor Dhamma Deshana during the Vesak week, Atapirikar and Gilanpasa for Atavisi Buddha Puja, kindly enter your name and contact number at the lists on the notice board. Please refer to the attached schedules.